With two full length LPs, national tours, and opening for the likes of Deer Tick, Wooden Birds, Blitzen Trapper, and so on I present to you...The Quick and Easy Boys. A Portland trio consisting of Jimmy Russel (Guitar/Vocals), Sean Badders (Bass/Vocals), and Michael Goetz (Drums). More commonly known for their R&B, funk, psychedelic rock, and pop infused sound. The boys quickly made a name for themselves in Eugene, Oregon before heading to Portland with their electrifying stage performances and the "leave nothing behind go all out kind of energy." 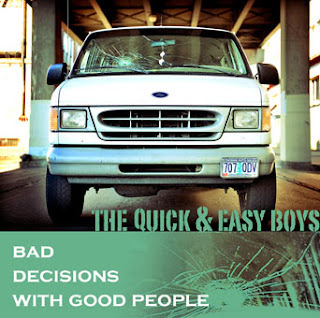 In 2008 they released their debut LP "Bad Decisions With Good People." Since then they have spent the last two years on the road bringing their unique "Minutemen, Funkadelic, and Willie Nelson" sound to the masses. Presently, the Boy's are touring through the spring to promote their sophomore release, "Red Light Rabbit." At times this album sounds like an extension of "Bad Decisions With Good People." The album kicks off, "with Foster I..." consisting of a fast-paced punk infused sound. The album continues into the single "Take Your Medicine" with layered guitar solos over the funk driven melody. The album takes you on a journey with an interesting array of sound from pop, psychedlic rock, and funk slowing down and speeding back up again. I'm not exactly sure how, but it works well. All in all "Red Light Rabbit" brings you the diverse sound with danceable tunes the Quick & Easy Boys are Known for.